JOIN US to learn about Green Dot! Green Dot is a prevention program addressing personal, power-based violence (e.g. bullying, sexual assault, domestic, violence, stalking, etc). Green Dot equips students, faculty and staff to recognize warning signs, develop intervention options, and proactively change cultural norms. The Green Dot program is a first step in a long term, comprehensive primary prevention strategy on campus and within our community. 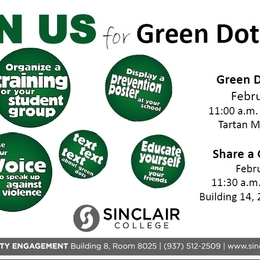 As a nationally recognized program that is supported by rigorous research, the Green Dot program has reduced violence. Please help make our college a Green Dot campus.